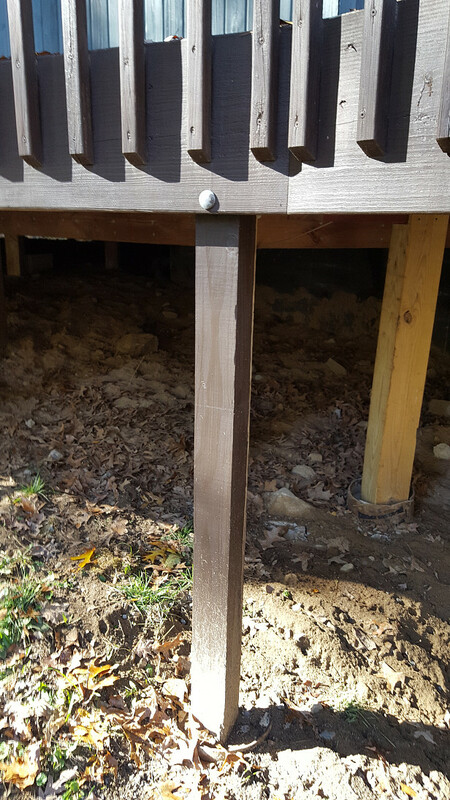 WHAT MY NETWORX CONTRACTOR DID FOR ME: Deck repair to bring the deck up to code and satisfy my insurance company’s requirements. WHY I CHOSE HIM: Quick response, reliable impression over the phone. We just bought this house in June and there were a couple of problems with the deck. The one my insurer was focusing on (the way the deck ledger bore was attached to the rim joist of the house) didn’t involve a huge repair. It was a safety issue, although a much bigger safety issue had been ongoing for a long time, which the insurance company strangely didn’t notice. 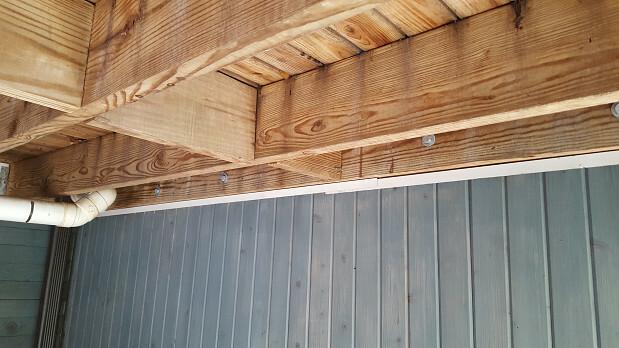 The really dangerous thing about our deck is that it had these big concrete support beams … but they didn’t actually connect to the deck. 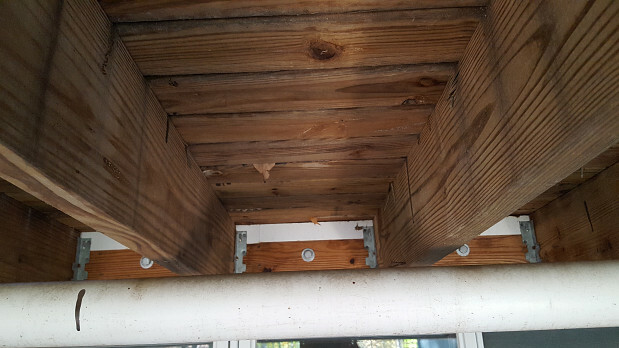 At some point, somebody had taken a bunch of cinderblocks and metal jacks, and used them to actually hold up our deck. To make matters worse, the deck is on a slope, so it’s 10 feet off the ground in one area and maybe 4 feet in another. It could have been catastrophic for someone to fall from the 10-foot side. Even if you were on the 4-foot section, you could have gotten seriously hurt. We have toddler twins and we want to keep them safe. First, I tried to get someone I knew to take care of the repair, but he was really flaky and I didn’t have time to wait around for him. At that point, I googled “deck repair” and got to Networx. Everyone on the list that Networx sent called me and I was planning to bring them all in to see who’d be the best fit, but CML Home Improvement was the first to contact me and after speaking with him, I could tell he’d be fine. He made me feel like he was reliable – and he was! 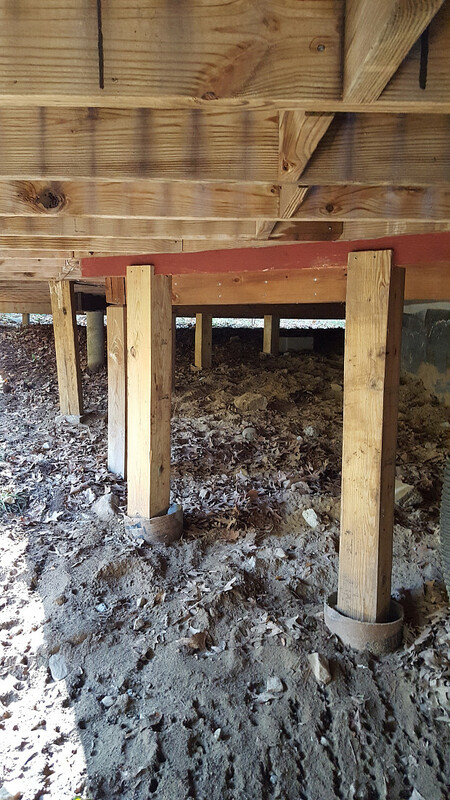 Since I had to hire a contractor to do the requested repair, I also had them replace the deck’s support system. It was actually a good push for us, because otherwise we would have probably put it off. The repair was kind of a weird job. He had to really think it through and make sure he could bring it up to code. But he did manage to figure it out and now the repair is finished. (It only took them 3 days!) I noticed that he was always there when his crew was doing the work. They were on task, and they cleaned up well after themselves. I’m happy with the results: they brought it up to code, the deck is safe now, and the work was quite reasonable. I think they were great and I would highly recommend them to anybody; they’re nice guys who did really good work … fast! In terms of advice, usually I would say that it’s good to use word of mouth, when you’re looking to hire a contractor. But in a case like this, where you don’t have anybody to ask, I’d recommend looking at online reviews and maybe using a company like Networx. You have a little more confidence when you know that there is a service that’s there to keep an eye on things. I use online resources for a lot of things like this, instead of flying blind. CML Home Improvement Anne Deredita: I am very happy with the work CML did, would definitely hire them again. Watch Out For Contractor Red Flags by Paula H.